Nostradamus is the 16th studio album by heavy metal icons Judas Priest. 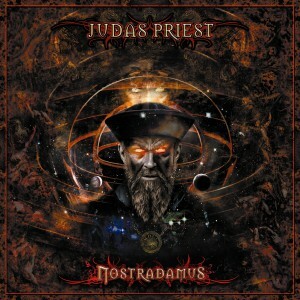 After testing the waters on their 2005 album Angel of Retribution with a 13 minute doom metal song, Loch Ness, it seems as though Judas Priest have gotten a real taste for pushing their artistic boundaries by ambitiously crafting a concept double album revolving around the life of the French seer Nostradamus. The most immediate thing you’ll notice, aside from the colossal length, is the inclusions of keyboards as a lead instrument. Sometimes they outshine or even bury other instruments (most notably Ian Hill’s bass) and are the foundation of no less than 9 interludes which are often accompanied by acoustic or soft electric guitar playing. While they work well to emphasise some of Rob Halford’s singing talents, they make up a combined running time of 17 minutes and can feel overdone by the end the album. It is worth mentioning that the interlude music is eventually fleshed out into a full song, the ballad Lost Love, which is presumably about the loss of his first wife and 2 children to the plague but the lyrics are vague enough to be interpreted in different ways. Death is another successful foray into doom metal and it’s a shame that the band only flirt with the subgenre since they prove to be rather skilled in this realm. War turns out to be one of the more experimental songs as it breaks away from heavy metal altogether and sees Judas Priest trying their hand at martial industrial music with surprisingly good results. In another twist, Pestilence and Plague is sung in both English and Italian but unless you understand Italian, it will be hard to say how accurate Rob Halford’s performance is. Between the interludes and experimentation we are left with much of their traditional heavy metal sound that is often played at the same mid-paced tempo which doesn’t do much to help the flow of the album. The title track, found near the end of the second CD, starts out like any of the other interludes before breaking into a speed metal frenzy with Rob Halford’s trademark wail to make you think that it has been ripped right out of the Painkiller album. Nostradamus would have benefitted greatly from more songs like this one, if for nothing other than the tempo to shake things up a little. Nostradamus would be more digestible if the material was condensed into a single album no more than an hour long but it is always good to hear a band expanding their horizons instead of running around the same hamster wheel endlessly even if the results aren’t perfect.